How many board games let you “travel the world” without leaving your dining room table? Well, there are a few… but not many of them let you conquer it! Originally called La Conquête du Monde (The Conquest of the World) by inventor and French film director Albert Lamorisse in 1957, the board game was brought to American audiences in 1959 as Risk!. The game of Risk’s iconic design consists of a rainbow of army game pieces and a board with fictitious territories (fun fact: real-life Afghanistan is not actually within the boundaries of the game board Afghanistan!). Although it’s been through many modifications, the general game play has remained the same over the last 57 years. Players take turns rolling dice in order to defeat other players’ armies and effectively take over each territory on the board. Attackers in the game get three dice rolls, while defenders get only two. For very serious game players (we don’t recommend taking board games too seriously), the ability to strategize based on statistical analysis can provide a leg up, similar to playing chess. December brings holiday cheer, chestnuts roasting on an open fire, and toy safety! The nation’s leading volunteer eye health and safety organization, Prevent Blindness America has declared December to be Safe Toys and Gifts Month “in order to keep the holiday season joyful for everyone.” Toy safety is a top priority, and organizations like the U.S. Consumer Product Safety Commission have also released safety tips and guidelines for buying and playing with toys. Safe toys haven’t always been the standard. In the past, kids played with tiny steam engines, used candles to light up the interiors of their toy train stations and dollhouses, and even handled dangerous lead to cast their own toy soldiers. 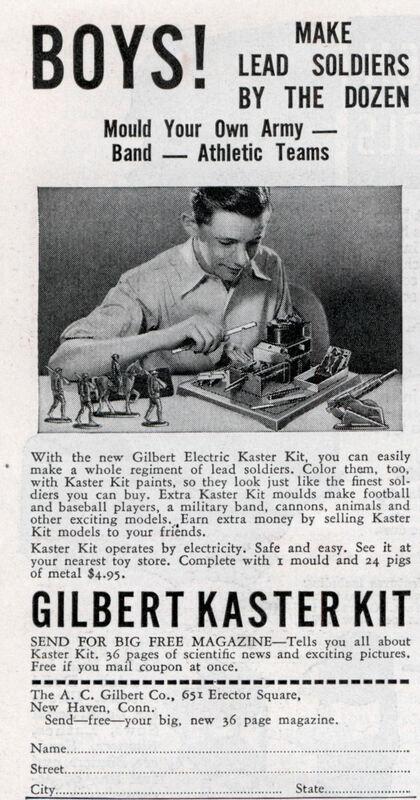 Anyone could buy blocks of lead and use a casting set to create toy armies and figures. This was marketed as an “easy and safe” activity…at least until the harmful side effects of lead were discovered and safety regulations were enforced in the 1960s and ‘70s. According to this article in Popular Science, just one of these lead soldiers contains enough lead to render several million toys unfit for sale in the U.S. by today’s standards. We don’t think Santa will be bringing any kids a lead casting set for Christmas this year! During World War II, many Americans got their first taste of recycling by saving and donating household items to support the war effort. Stockings became parachutes; leftover cooking fats were turned into glycerin for gunpowder. From 1942-1945, metal was so scarce and necessary for the war that even the Oscar statues given out at the Academy Awards were made of painted plaster. Kids got involved by marching their toy soldiers to scrap metal collection facilities to be melted down for the war effort. In order to stay in business, toy manufacturers were forced to find different materials for their toys. One company, Playwood Plastics, survived the metal shortages by making soldiers out of sawdust mixed with a glue-like substance of water and flour. The mixture was stamped into shape and left to dry. The soldiers were then hand-painted. Not as hearty as their metal cousins, many broke apart over time. T/m’s pair retain traces of their original blue paint. The distinctive “P” in a triangle marks them as Playwood Plastics soldiers.